Congenital diaphragmatic hernia (CDH) is an anomaly of infants. It is associated with other anomalies, including pulmonary hypoplasia, malrotation of the gut and patent ductus arteriosus (PDA). Hence it is essential that it is diagnosed early. Sometimes, it can remain unrecognized till adulthood, if no other associated developmental anomalies, like pulmonary hypoplasia, occur. In adults, it is diagnosed when intestinal contents herniate into the thorax causing pulmonary and intestinal complications. It is mostly present on the left side because of late fusion of the pleuro-peritoneal membranes, and the absence of the liver on the left side. Moreover, it is commonly due to trauma in adults. A case report of a right sided diaphragmatic hernia of Morgagni type in an adult was discussed. Keywords: Congenital diaphragmatic hernia, Pulmonary hypoplasia, Pleuro-peritoneal membranes, Morgagni. D, Kumar et al. RIGHT SIDED CONGENITAL DIAPHRAGMATIC HERNIA OF MORGAGNI TYPE IN ADULTS: A RARE ENTITY. Journal of Health and Translational Medicine, [S.l. ], v. 21, n. 2, dec. 2018. ISSN 2289-392X. 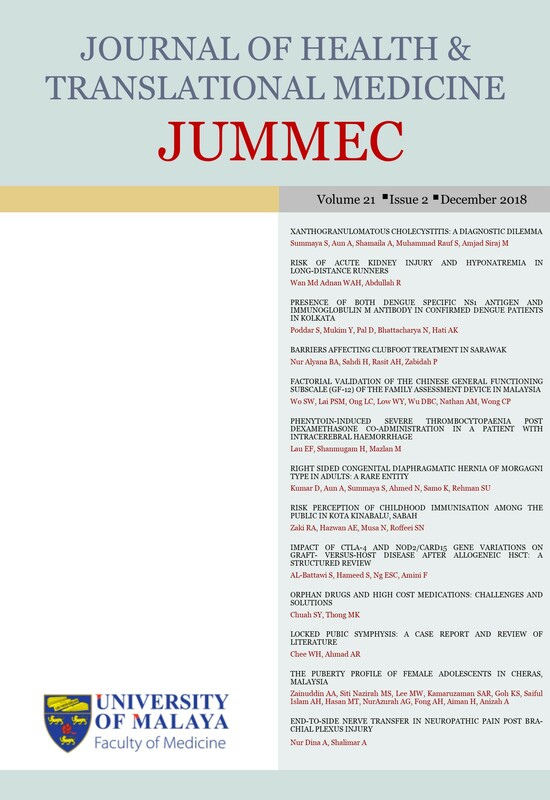 Available at: <https://jummec.um.edu.my/article/view/15436>. Date accessed: 19 apr. 2019.